Colourful, die-cut dots and playful, grooved paths encourage little fingers to move and explore in this latest TouchThinkLearn board book. In a format unlike any other, the groundbreaking TouchThinkLearn books offer the youngest learners an opportunity to explore in a hands-on, multi-sensory way. 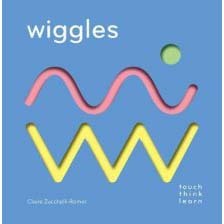 Seeing the image, tracing its shape, saying its name: These modes of perception combine to stimulate understanding of essential concepts.Wiggles adds a new dimension to the bestselling TouchThinkLearn series, cementing the position of TouchThinkLearn as the premiere go-to line of creative, tactile learning titles.